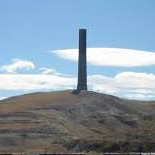 Selected by Marcus Daly as a smelter site in 1883 because of an abundant supply of good water, Anaconda was the home of the Washoe Smelter of the Anaconda Copper Mining Company until 1980. History has been made here in the science of copper smelting, and the plant is famous throughout the mining and metallurgical world. From a straggling tent town, Anaconda grew to be a modern city but retained all of the aggressive spirit of the pioneer days. This spirit refused to die with the Anaconda Co. pullout and the town remains a vital community.